Boryspil city court in Kyiv region sentenced on Thursday an activist of Ukraine's women's movement FEMEN, Yana Zhdanova, to fifteen days of administrative arrest for her protest action against Head of the Russian Orthodox Church Patriarch Kirill at Boryspil Airport on Thursday morning. Interfax-Ukraine learned this at Kyiv regional branch of police. As reported, the half-naked woman belonging to FEMEN approached the patriarch while he was talking to journalists at the airport and shouted 'Go Away!' before security apprehended her. Zhdanova was accredited as a journalist of the Kharkiv newspaper Vesti. 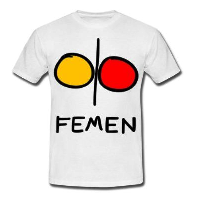 This entry was posted in EN and tagged news on July 27, 2012 by FEMEN.